(Kortemma - syn. Island Fire) - No variety of ground cover rose has better substance of colour than this brilliant semi-double bright velvety red, with a clear set of yellow stamens. Foliage is light reddish green with evenly spaced clusters of blooms that continually repeat. 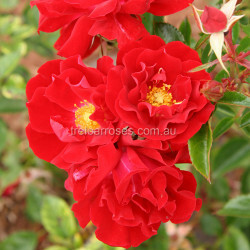 Extremely healthy with compact spreading growth to 45cm high by 90cm wide. We cannot recommend too highly. Guaranteed to satisfy. The name translates to Island of Fire.